Map to Beta Monocerotis, modified from the Monoceros constellation diagram on Wikipedia. Hey look, I finally posted a new mission. I’ve been slowly working away at the Astronomical League’s Double Star Club, and I just discovered this gem last week. It’s not the world’s easiest star to find. As a naked-eye subject, the constellation Monoceros, the Unicorn, is fairly dim and unimpressive. Beta Monocerotis is prominent in the western part of the constellation, just east of Orion and north of Canis Major, making a wide triangle between Sirius and Kappa Orionis (also known as Saiph, which is Arabic for “sword of giant”). I could just make it out with the naked eye from Claremont, hovering in the light dome over Los Angeles. To fully appreciate this star’s charms, you’re going to want a telescope, but it doesn’t have to be a big one. I made my observation with my 80mm refractor, which has a focal length of 900mm (f/11). Using a 32mm Plossl eyepiece (28x), it was clearly a double star but not cleanly split (seeing was lousy). With the 12mm Plossl (75x) it was clearly split into a nice pair of equally bright gems. I decided to go up to 150x with a 6mm Orion Expanse , my favorite high-power eyepiece. So glad I did–at 150x, the southern member of the “equal pair” turned out to be a double itself, also of equally matched components! It was a nice surprise and a breathtaking sight, the three stars twinkling away at 150x. I looked at dozens of photos, sketches, and eyepiece simulations of Beta Monocerotis while writing this post, and the image that come closest to capturing what I saw at the eyepiece is this sketch by Jeremy Perez, who kindly gave me permission to include it here. 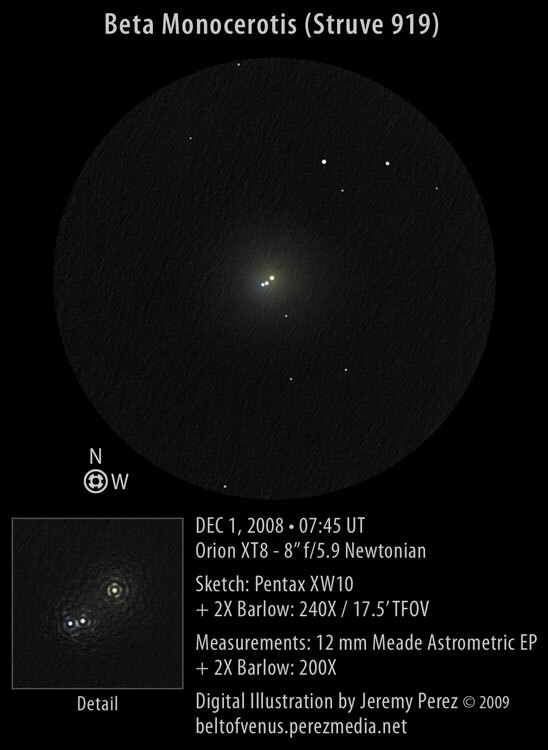 Jeremy is one of the authors of Astronomical Sketching: A Step by Step Introduction, and his website, Belt of Venus, has beautiful and evocative sketches of just about everything in the sky, from the moon and planets to deep sky objects and double stars. It’s definitely worth checking out, both to marvel at his work, and to get ideas for your observing wish list. A poster on Cloudy Nights had this to say, “I just looked at Beta Mon last night in good seeing. What a neat thing. 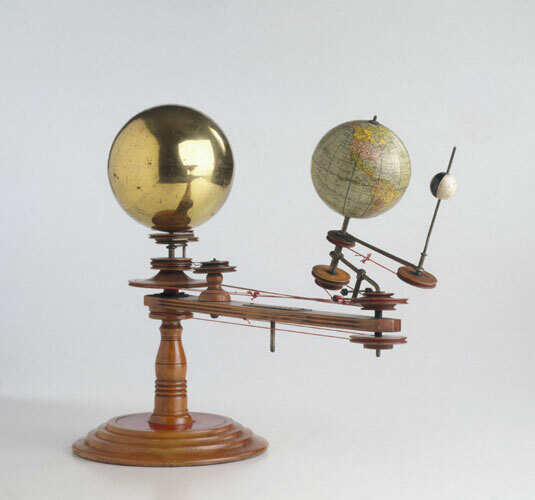 It reminds me of one of those antique mechanical solar system models.” I couldn’t agree more–it conveys exactly the same sense of mechanical precision and aesthetic appeal as an old-fashioned orrery. 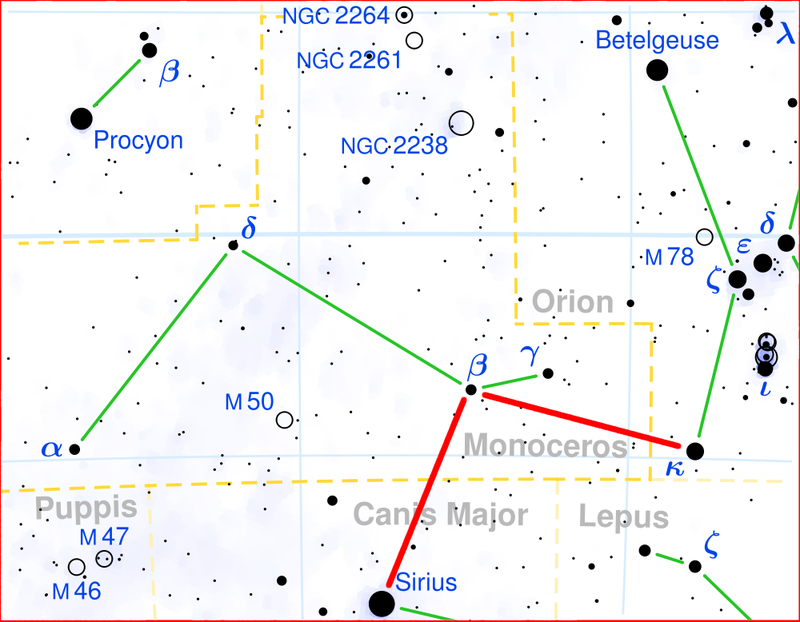 If you’re going to catch Beta Monocerotis, you’ll need to do it soon after dark, because Monoceros is following Orion to the western horizon fairly early these days. Go have fun!